We generally allow reselling of Luna Node Dynamic virtual machine services. To avoid account issues, please contact us and request to have your account marked as reseller; in your request, include the domain name where you will be selling services from. Note that in cases where we notice a large amount abuse from a single reseller customer, that customer may be terminated; this shouldn't be a problem if you verify new orders. We offer a powerful API that should have everything you need to create your own panel for reselling. For smaller businesses, we have a ready-made module for the popular WHMCS billing platform and a hourly billing reseller panel called Lobster; see below for more information on these. The module code is available at https://github.com/LunaNode/lndynamic_whmcs. The remainder of this section will cover installation instructions, assuming you have already installed WHMCS. Upload lndynamic_whmcs.zip to your web server and extract to the /path/to/whmcs/modules/servers/ directory. This should create a new directory, /path/to/whmcs/modules/servers/lndynamic/. Go to your Luna Node Dynamic account and create a new API key (at this time the module still requires legacy API keys). You may choose to enter restrictions if desired. Save the API ID and API key for later. Create a new product/service, with product type "Dedicated/VPS server". Under Module Settings, select "Lndynamic" for the module name. After saving changes, more fields will show up. Enter your API ID and API key from previous step. Then select a plan name for this product; you can leave the plan_id field blank. Under "Custom Fields", add a new field with Field Name set to "vmid", Field Type as "Text Box", and check the "Admin Only" box. This will be used to save the backend VM ID for each service on this WHMCS product. Save the changes. Go to Setup -> Products/Services -> Configurable Options and create a new group for lndynamic (you can name it "lndynamic config options"). Inside the group, select all products using the Lndynamic module. Add a new dropdown configurable option with Option Name set to "Operating System" (case sensitive). Each option will be an operating system that the user can choose when purchasing a VM for the first time; for each option value, use either "NAME" or "NAME|DISPLAYNAME" where NAME is the image name and DISPLAYNAME is the name that you want to show to the user. The module supports start/stop/reboot VM, VNC, reinstallation, and more. 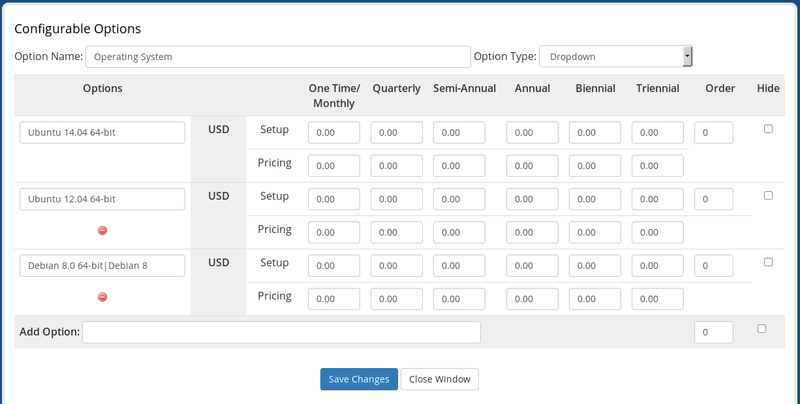 Lobster is an hourly billing panel for virtual machines. You can link it with your Luna Node API keys so that users can create and manage virtual machines directly from your own control panel. Lobster is still in early development stage, so installation may not be completely straightforward, and some template configuration is needed to get something that works with your website. This page was last modified on 22 March 2016, at 16:57. This page has been accessed 27,684 times.